Cyberoam network security appliances, available as UTMs and Next Generation Firewalls, deliver enterprise-class network security with stateful inspection firewall, VPN and IPS, offering the Human Layer 8 identity-based controls and Layer 7 application visibility and controls. Cyberoam ensures high levels of network security, network connectivity, continuous availability and secure remote access with controlled network access to road warriors, telecommuters, partners and customers. 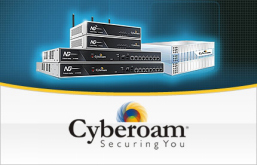 With granular controls and advanced networking features, Cyberoam network security appliances (UTMs and Next Generation Firewalls) offer enterprise-class security and high flexibility with protection against blended threats, malware, Trojans, DoS, DDoS, IP spoofing attacks, spam, intrusions and data leakage. Shift from Firewall to UTM/NGFW security – The Cyberoam firewall is tightly integrated with features like Application Visibility & Control, VPN (IPSec & SSL VPN), Intrusion Prevention System, Web Filtering, Bandwidth Management, Anti-Virus & Anti-Spyware, Anti-Spam, and Multiple Link Management to provide unified security. Layer 1 to Human Layer 8 Firewall – The Cyberoam Firewall implements policies based on the Physical Layer 1 to Application Layer 7 and Human Layer 8 with User Identity in addition to source, destination zone, IP address and application. It enables organizations to control access to network resources based on the user identity, work profile and application access requirement of external users like customers and partners, internal LAN users and employees outside the perimeter like road warriors, telecommuters. It also offers user identity-based security in dynamic Wi-Fi, DHCP and shared endpoint environments. VPN – Cyberoam offers VPNC-certified IPSec and SSL VPN over its network security appliances, ensuring easy-to-manage secure remote access with high business flexibility while lowering the capital and operating expense involved in deploying dedicated VPN appliances.